Can I import data from another tool into LSP.expert? Yes, you can import data from another tool or Excel into LSP.expert. For that, you have to go in Settings > Import/export. You can import your list of clients and your jobs and invoices. You have to respect the layout of our .csv sample file to be able to import your data. You can download this file and fill it in with your data, or you can adapt your own Excel file so that it matches our sample file. 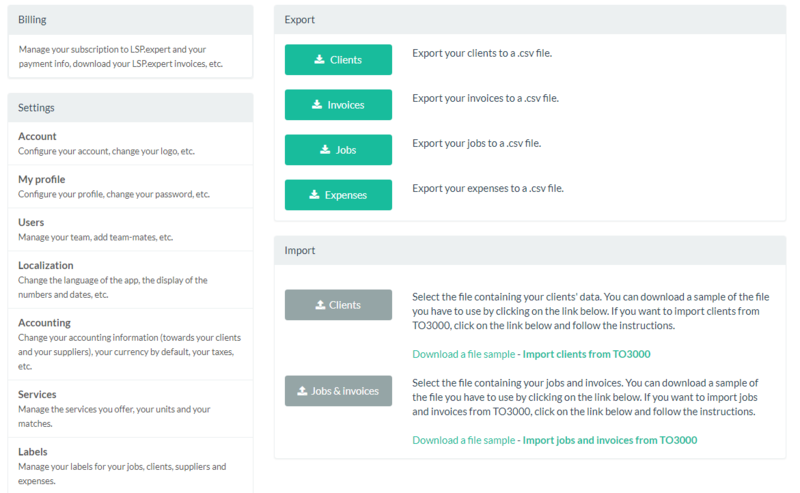 If you are a TO3000 user, you will see that there is a special link for you to import your clients, jobs and invoices. You have to download a little tool we created and you will be able to import everything in just a few clicks (simply follow the instructions in the tool).